Neither synonymous with glamour nor a byword for luxury, England's best motorway service stations have been unveiled after a comprehensive survey... but the services from hell are named and shamed too. Transport Focus conducted the study of 112 pit-stops. In compiling the list, the travel watchdog questioned 8,700 customers on key factors including staffing, food and the all-important lavatories. Perhaps surprisingly, the same company. Moto, operates service stations at both extremes of the ranking. The M4's Reading Services Westbound takes the crown for the country's best stop-off - with a customer satisfaction score of 100%. But bottom of the pile came Heston Services Eastbound, with a rating of 62%. The west London respite - which turns 50 next year - is the subject of scathing Google reviews. One described it as "dirty, old and tired", while another said it was the "worst motorway services I've ever been to". Toilets are condemned as "pretty rank", while another reviewer advised: "Keep going, you are nearly in London." A spokesman for Moto, which operates Heston and Reading services, said: "We're disappointed that the visit to Heston East was done in the middle of building works, although we recognise that in this instance we haven't done as well as we should have done. "It's only fair to point out that Heston East is one of the smallest service areas on the motorway network and so is unable to provide many of the facilities we have at our larger sites." AA president Edmund King said: "British drivers have a love/hate relationship with service areas. "For some people, being able to get a decent, discounted coffee is all they ask for - and that might just enhance their safety." Transport Focus chief executive Anthony Smith said: "Our research shows that up and down the country motorway services are providing customers with a good experience and are playing a positive role. "They tell us they feel less stressed and are more awake after a good break. "Motorway service operators must not rest on their laurels, however." Transport Minister John Hayes said: "Motorways services can and should be lovely places for drivers to enjoy - not just places they have to stop. "Congratulations to those scoring the most highly. They show what can be done." 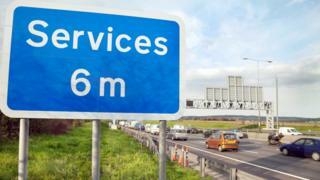 Which motorway service stations do you love or hate and why? Share your views and experiences by emailing haveyoursay@bbc.co.uk.